WALIA CONCRETE TRUSS PAVER is designed & manufactured from graded section for laying, leveling and compaction of concrete. Grade of M-10 to M-40 with different slump can be casted with this machine. The Walia Truss Paver is most suitable for paving of concrete from 3 mtrs to 15 mtrs and a thickness of 75mm to 350mm can be easily laid with this machine. 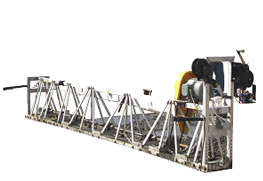 Walia Truss Paver easily works on steel and wooden shuttering & there is no special track is required for casting the concrete. Machine is ideally suited CITY ROADS, RIGID PAVEMENTS (PQC), DECK SLABS, WEARING COURSE, RUNWAYS AND HANGERS. 10 Mtr. 12.5 Mtr. 15 Mtr Paving Length Pavers are also available.